I finished this watercolor about 2:00 a.m. this morning. It’s a relief to have it finished, knowing it only took five days. As I look on the finished composition, I still feel the sadness of a civilization that has died. I’m old enough to recall Highway 66 road trips when I was a child, and I cannot help but listen for the ringing of bell cables every time I see the husk of a service station such as this one, languishing on vacant property adjacent to a county road or service road that was formerly an artery carrying traffic across this nation. As a teacher, I’ve returned to my campus this week to honor my contract. The students will appear next Monday. Whether or not I begin a composition before then, I just don’t know at this point. I have my first One Man Show beginning on September 10. A part of me wishes to continue painting up till the day that we open, but another part says I already have enough work ready to hang, and that a hiatus might be the healthy road to take right now. Maybe I’ll decide by tomorrow! Thanks again for reading, and helping me see this one through. The fourth day on this work sees it nearing completion. I had to re-draw the gas pump to align it parallel with the station. The distant lamp post was in the wrong place and no proportioned to the rest of the composition, so I am eliminating it. most of today was spent trying to separate the graveled parking lot from the puddles. I still have grasses to render, poking up through the puddles as well. The center of the parking area also needs to be tended. But I think the end is finally in sight. If I don’t complete it tonight, then I’m quite sure I can sign off on it before tomorrow is over. This has been a rewarding experience. Painting water reflections has been a trial for me, but I’m sure I’ll attempt it again some day. 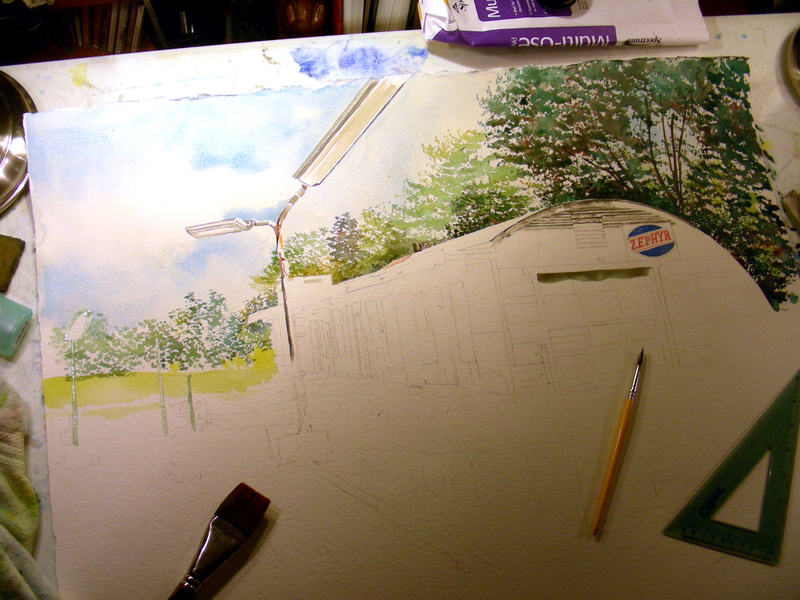 The painting is slowing down, now that I’m nearing the end of my third day. Painting water reflections is completely new territory for me, and I spend more time studying the reference photos, applying masquing fluid to the paper and mixing pigments than actual painting. But I am enjoying the process, and today is the first time I’ve felt “lost” in the painting, in a good sense. School begins tomorrow for me, but I’ll continue with the painting daily until it’s finished, hopefully before this next week runs its course. Tonight before retiring to bed, I hope to enrich further the shadows in the water reflections and attempt to render the grasses sticking up out of this enormous parking lot swamp. For any of you reading this for the first time, the location of this station is Villa Ridge, Missouri, on Route 66 southwest of St. Louis. Currently the station is at county road AT, about a mile off Interstate 44. 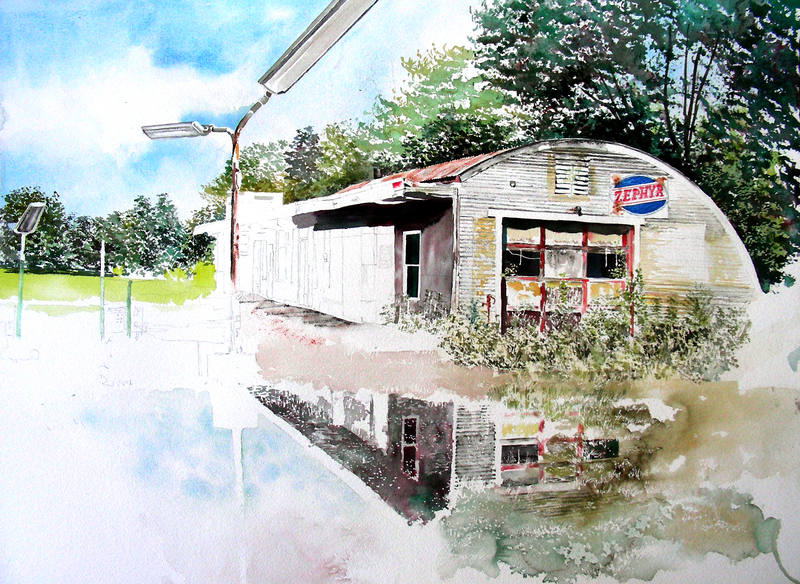 I saw it for the first time in the summer of 2010 and did two plein air watercolor sketches, one of the end of this building, and the other of a rusted-out, foliage-covered billboard advertising Zephyr detergent gasoline. I’m feeling glad that I was able to chip away at this watercolor throughout a long and solitary Saturday. It’s time to put Route 66 to bed for now, but I’m looking forward to rising tomorrow and resuming the enterprise. 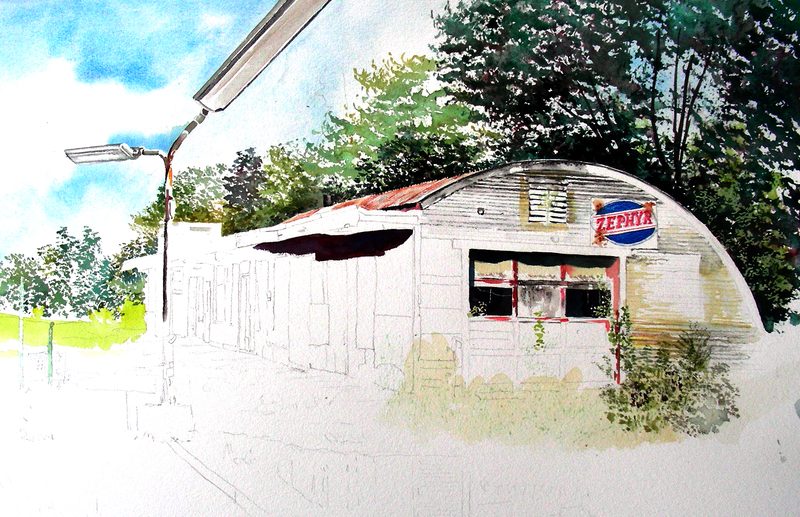 This will be my first full-size watercolor of a Route 66 composition. I’m now hoping the painting will have enough quality to include in my One Man Show next month. Until tomorrow then. Thanks for reading. 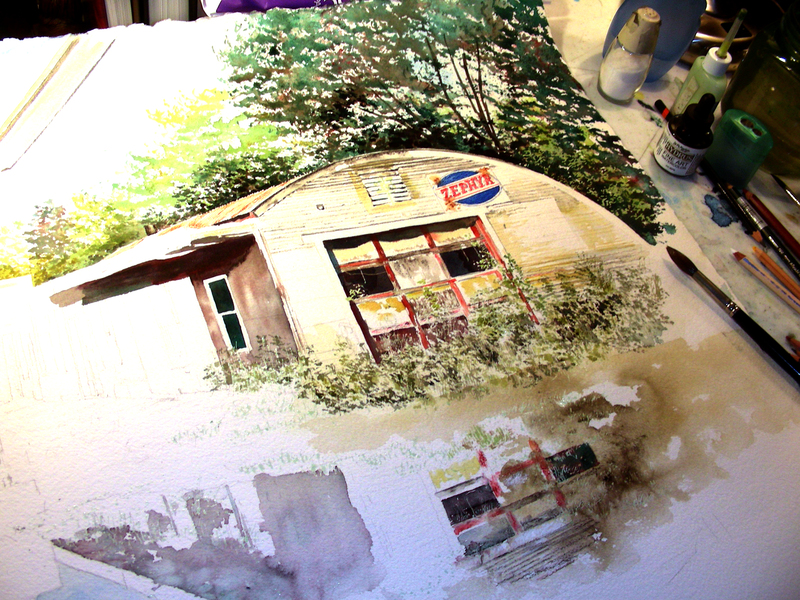 Today marks my second day working on this 22 x 28″ watercolor of the Villa Ridge, Missouri Zephyr station along historic Route 66. I have researched and found the lights and gas pumps that once stood on this location. They are absent now. I’m also trying to restore some of the details of this Quonset hut filling station that are now out of sight behind plywood panels. The Zephyr gas sign is my own idea–I have no idea where the logo originally hung. 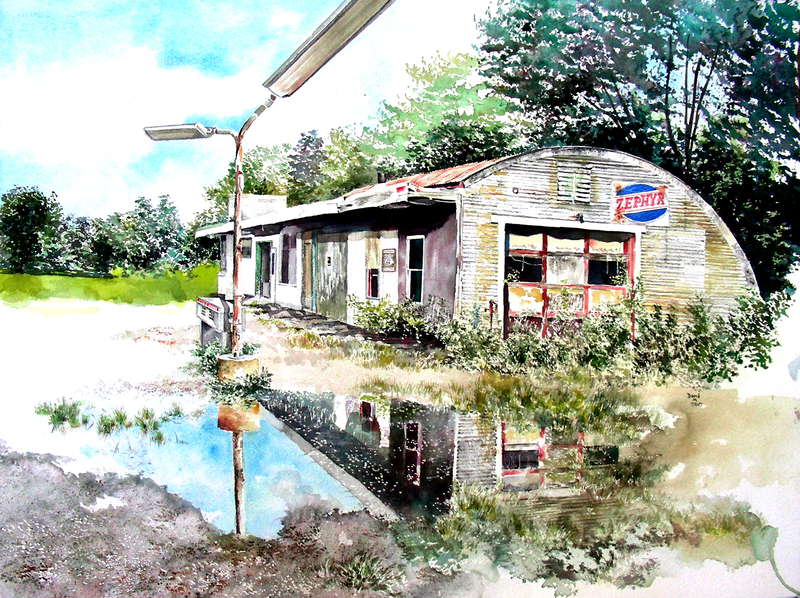 Last week when I visited this location for the second time, hard rains had fallen, and the enormous puddles in the foreground reflected the derelict structure. I’m going to attempt the reflections once I get to the bottom portion of this composition. So far, it has been slow to emerge, but I will hopefully chip away at it on a daily basis, and not allow school next week to interrupt my flow. The paradox of “loss” and “presence” flooded me when I stood in the presence of this structure last week, in the moist air, and listened, recalling the sounds of bell cables being run over by cars entering and exiting the busy Route 66 station. I recalled the smell of grease, dirty tires and of course, that ever-present gasoline scent that I loved to inhale as a child! I still remember attendants emerging from the building, wiping their hands on red shop towels as they approached cars cars pulling into the bay. How long has it been since full-service ended? I’m still trying to remember the first time I pumped my own gasoline when I pulled into a station. I suppose it was around 1973. At any rate, last week, I felt the loss as I stood in this vacant space, waiting in silence, and then I felt the presence of the past. I hope I can put some of that into this painting. I laugh when I read of Edward Hopper and Andrew Wyeth chafing every time a critic called them illustrators. I go through that every time I do a painting of this type of subject–my soul is flooded with feelings and emotion, and yet I realize that I do not know how to paint “mood”–all I can do is illustrate what I see, and hope that somehow the “mood” emerges when a viewer looks at my work. It’s been awhile since I’ve posted, or painted. I spent a week visiting my family in St. Louis (my roots) and returned to this abandoned Zephyr station in Villa Ridge, Missouri, southwest of St. Louis on historic Route 66. 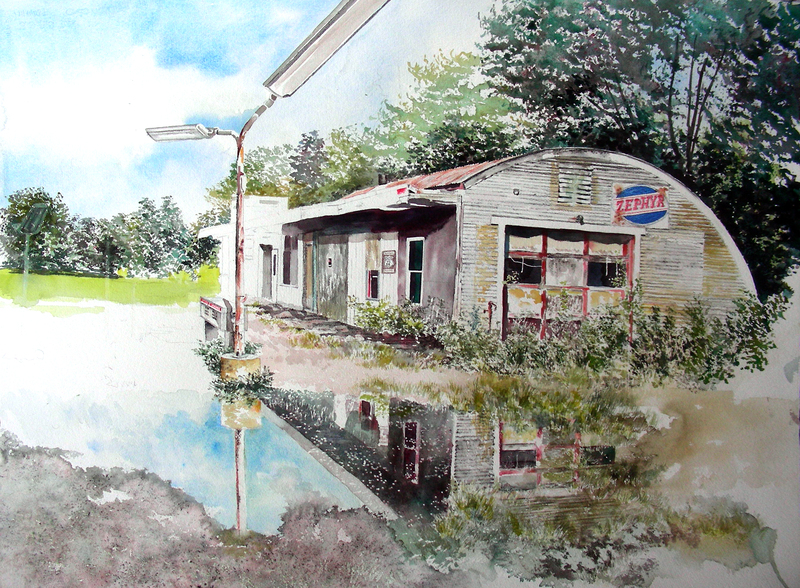 I created two plein air water color sketches of it last summer, and posted them on this blog then. Now I am attempting one that is about 22 x 28″. I’ve gotten more comfortable working larger, and would like to add another piece to my approaching One-Man Show at the Weiler House Gallery September 10. I have plenty of time to finish this, though I return to school Monday. We’ll see how much gets done during this quiet weekend.